The recent Restud Tour turned out, in many respects, to be the research event of the year for us, and we hope to keep the inspiration and ambience it created going for some time. Here is a short summary for those who could not come, including a short joint interview. The two days were filled with presentations and discussions with the seven speakers, all PhD candidates from various US universities, whom the Review of Economic Studies selected as the most promising young economists. CERGE-EI in Prague was their second stop, preceded by the Queen Mary University of London, and followed by the University of Copenhagen. 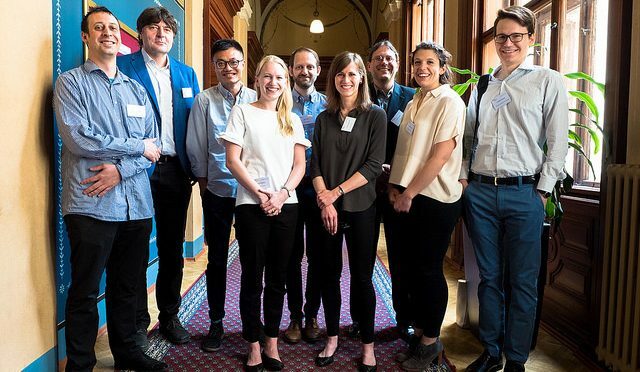 The speakers, in order of appearance, were: Heather Sarsons, Molly Schnell, David Yang, Ludwig Straub, Jann Spiess, Harry di Pei, and Giulia Brancaccio. Thanks to all of them for the time they spent with us and their insights, we hope to see them again at CERGE-EI in the near future. What was the best thing about Restud for you, personally? David: The best part of the ReStud tour is certainly to be able meet people in various European institutions, having stimulating discussions on research, and to be able to know and hang out with six other amazing people along the tour as well. Molly: I had an absolute blast on the tour, so it is hard to pick just one aspect. In general, I really enjoyed spending time with faculty and students of the host institutions outside of the lecture hall—everyone was just so welcoming and generous with their time. Did the European audience bring any new inspiration for you? David: Yes. They asked somewhat different questions, and were always fun to engage with. Molly: As someone studying health care delivery in the US, I found discussions with people familiar with different health care systems incredibly useful. There is a multitude of differences between how care is delivered in the US versus Europe, and I hope to leverage some of these differences in future work. Ludwig: The European audiences definitely brought a new perspective to my projects. This was not really place-specific, however, but rather person-specific. For instance, Ctirad, Marek and Veronika at CERGE-EI each offered a different and very illuminating perspective based on their education and their own research. Learning to see one’s own project through new eyes is definitely a very rewarding part of the Restud Tour. How do you keep your motivation, if your research does not bring the expected results? David: Being open-minded and ready for the surprise of the data are actually one of the most fun parts of research! Molly: I was once advised to only work on projects that are interesting regardless of the direction or significance of the results. If the question is important and the methodology is sound, any result is useful! Ludwig: This is a tough question, which everyone probably has their own strategy of dealing with (and which lots of people have a lot more experience than myself). Personally, one thing I have learned over the past few years is that it can be very helpful to have a plan sketched out about exactly what the project is supposed to achieve, how it contributes to the literature, etc. This then helps provide one with a set goal as well as a kind of artistic integrity during periods where codes don’t work, results don’t come, or other obstacles arise, and it is very easy to lose sight of the bigger picture one is after. Do referring physicians view patient outcomes differently depending on the performing surgeon’s gender? Heather Sarsons presented her job market paper where she focuses on how physicians interpret new information about surgeons and how this learning differs with respect to gender. As one would expect, when the surgery goes better than expected, physicians tend to recommend the surgeon more and when it goes badly, they recommend the surgeon less. However, when the surgeon is a man, physicians tend to put additional weight to good news and lower weight to bad news. Furthermore, there is evidence that the recommendations suffer from spillovers for women, but not for men. When a physician has a bad experience with a female surgeon, he tends to recommend other women less. Perhaps surprisingly, men do not suffer from this effect. Heather Sarsons shows evidence of this behavior, on Medicare data, using a matching empirical strategy. This means that she matches every surgeon with the most similar surgeon from the other gender, using their and their patients’ characteristics and then compares their recommendations from physicians. Patients and physicians: How have they contributed to the opioid epidemic in the US? Molly Schnell’s job market paper focused on evidence that suggests that people increasingly abuse prescription opioids in the US. One of the reasons for this is a conflict of interest of physicians who are paid per patient visit. Putting your patients on opioids is a relatively cheap treatment, which makes patients addicted, providing regular and short visits to the clinic, and in turn higher revenue. While many users get their pills from their physician on prescription, some of these pills are resold on the secondary market to other people. Such practice is, of course, illegal. However, if physicians cared about the impact on public health through the resale of opioids, they might prescribe them less often. Such pressure on physicians might in turn cause the presence of a secondary market to lower the widespread abuse of opioids. To evaluate the conflicting effects, Molly Schnell builds a model of behavior of physicians and estimates the impact on public health from abolishing the secondary market. To be able to do this, she has to capture how much the physicians care about the possibility of resale. She does that by exploiting the introduction of a special coating, which made one particular pill, Oxycontin, less attractive for the secondary market. Physicians who cared if their pills are resold would then switch their patients to Oxycontin, while others who cared more about their profit would switch patients from Oxycontin. Finally, her results show, that abolishing the secondary market is indeed beneficial to public health, but the best approach would be to target both the secondary market and the overprescription of pills. What happens if you remove censorship for 18 months? For political reasons, many popular international web pages are not available in China. The Chinese government uses the so called Great Firewall to censor them, but the Great Firewall can be circumvented at low cost with a VPN service. Despite this, rather a low number of people try to access the banned web pages. In their paper, David Yang and Yuyu Chen try to explain why: they designed an experiment which examines how censorship affects human behavior. During the experiment with 1800 students at Peking University, Yang allowed some of the students uncensored internet access. Perhaps surprisingly, it turned out that the unlimited access itself had no significant effect on students, which confirms the low demand for banned web pages. Everything changed when students started to receive advertisements for these pages: they visited them frequently and kept doing so even when the advertisements stopped. It proves that students did not avoid banned web pages from fear, but because they underestimated their information value. It shows that the Great Firewall policy not only suppresses the availability of international web pages, but first of all their purpose and relevance. The experiment proved that visiting international web pages had a profound effect on student opinions and knowledge. Further questioning of their roommates showed, however, that the new information did not spread easily among them. Pictures from the event can be found on Flickr.